Excel™ Gel is a glycerin-based dressing containing aloe vera. Maintains a moist wound environment. For cuts, burns, abrasions, pressure ulcers and first- and second-degree burns. 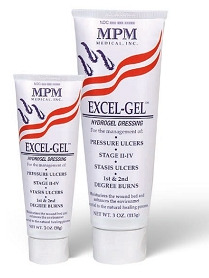 Apply Excel™ Gel to the wound bed approximately (1/4)" thick and cover with secondary cover.